It has been hard becoming seriously disabled over a long time but one of the greatest pleasures has been learning to work really well and democratically with my helpers. My first helper and I used to cook together because I was finding it difficult to stand long enough to cook alone. I didn’t want to give up altogether. We started off very uncertain about the effect of our cultural differences but soon learnt to enjoy it as a point of discussion and exploration. I was taught to make samosas, Indian coated chicken and many other such recipes. After a while the food we produced came to be a bit more of a fusion of our two cultural identities. I might add that we are both British and living in Central Britain but just of different cultural backgrounds and I always think very hard about being an absolutely fair and responsible employer. Just now I am benefiting from my interest in the beautiful fabrics of Africa. On this occasion I am again having a bit of help to use these fabrics for my greatest love of all which is developing the decorative aspect of my home. I found a UK website which is a wonderful source of fair trade african batik fabrics, beads, baskets and many other very beautiful things. I do have a concern about fair trade conditions. At the moment I have a number of projects on the go which are being worked at over time. There are these finished beautiful cushions. I’m not quite sure if these are lizards but I think they are even though my Dad said they were turtles! I like lizards as testified by this ever-evolving set of objects on my dressing table. I also adore these baskets which are perfect for beads, sewing stuff and knitting kit. I am making some table mats in the same lizard batik which, padded and quilted are also going to be decorated with a simple Sashiko running stitch in white or caramel around the lizards. I’m having some help with the machine sewing but I’m doing the hand stitching. I’ll let you know later how these go. Sashiko is a simple Japanese embroidery method. I chose this simple relief batik squiggle fabric and another very beautiful pink batik for cushions for the bedroom. These evolving decorative projects are great to have around. I’m not doing all the work but it feels very productive. I love the results. Do I need to feel guilty? Well, the other day I read of a disabled women who died alone without her Government payments or help. I spend a lot of time distracting myself from these issues in our Society because I am managing at present quite creatively, but there are major inequalities built into the system of support as well as the exploitation of labour and goods from abroad and we all need to consider what we truly think about it. 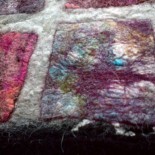 This entry was posted on 26/06/2014 by Themidlandperfumer in blogs and creative websites, craft, crafts and crafting, creative process, diary, textiles and tagged cultural, cushion, cushions, decoration, decorative effect, equality, fair trade.